Black Gate is very pleased to offer our readers an exclusive excerpt from Michael Johnston’s upcoming epic fantasy Soleri, to be published in hardcover by Tor this summer. We have the extended, “Director’s Cut” version of the prologue, entitled “The Black Sand,” which sets up the mythology of the book. Here’s a taste. They used to be fishermen, but that night hunger made them thieves. Under a moonless sky the men set out from the island in small wooden skiffs, sailing across the ink black sea toward the distant city. They were crowded in the long thin boats, crammed shoulder to shoulder, some turned sideways or doubled over to shield themselves against the waves. Gusty wind and angry water forced a few ships to turn back, while others were lost to the surf, and those who journeyed onward kept their eyes focused on the horizon, searching for the dim silhouette of the Dromus. The great wall was hewn from cinder-grey rock and reflected no light, its jagged ridge biting at the lowhanging stars like a blacker piece of night. The skiff rolled and the boy caught sight of the desert barrier. His stomach ached, but not from nausea. He had eaten little in the past few days — stale salt cod, sea grass steeped in broth. Up ahead, the first raiders made landfall. One by one the boats crashed into the surging whitecaps at the edge of the beach, the waves tossing the smaller ones, dashing others on the rocks, leaving the fishermen scrambling in the tide. The undertow took the unluckier of them, their bodies rolling over and over in the froth. Those who made it to shore moved quickly to conceal their arrival… The boy waited, trembling with fear and excitement as the last skiffs ground their hulls into the beach. The men were restless, eager. He felt an elbow in his side and craned his neck in time to catch the first sickle of sunlight as it lit the upper edge of the Dromus with a golden halo. The complete catalog of Black Gate Online Fiction, including stories by Mark Rigney, Michael A. Armstrong, C.S.E. Cooney, Vaughn Heppner, E.E. Knight, Jason E. Thummel, Judith Berman, Howard Andrew Jones, Dave Gross, Harry Connolly, and others, is here. 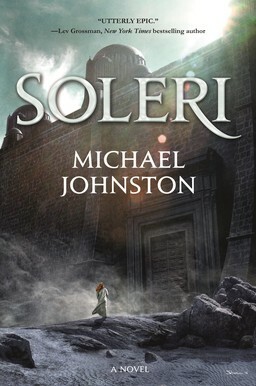 Soleri is 368 pages, priced at $27.99 in hardcover and $14.99 for the digital edition. It will be published by Tor Books on June 13, 2017.